Death, the final frontier. These are the lives of the starbaby Humans. Their 7000-year mission: to explore strange new hearts, to seek out new life and new religion, to boldly go where no man has gone before. OK, a thousand pardons for re-writing that famous opening line from the original Star Trek television series. Death IS the final frontier. All humans are eternal, death is just a passing over of the line between this life and the next. However, the life in the next is permanently and eternally fixed. One will either pass over the boundary into the final frontier into hell, or into heaven. For the Christian, the anticipation of the next life is real and exciting. We believers are not so thrilled about the process of death, whether we drown or are in a car wreck or a tornado takes us or any of the other imaginative means under which our body expires and we’re launched into glory. But the anticipation of being forever with Jesus, in His New Jerusalem, in glory…ahhh, it is a balm for the troubled soul dwelling in this strange land. For the non-believer, death is terrifying. They do not know what the next life holds for them. They all do suppress the truth in unrighteousness, (Romans 1:18) and thus deny themselves certain knowledge about what lies beyond the veil. I like reading historical papers from my area. It’s fun to read an old newspaper from late 1800s to early 1900s about the town I live in. It gives me perspective and a peek into a way of life that is gone by. One thing that has passed into history is the flowery, poetic obituary.The History of the Obit is presented in short, bullet point form, and it’s pretty interesting. The difference in a Christians’ obituary language and a non-Christian’s obituary language is stark. Here are a few examples of Christian obits. At the home of Dr. B.W. Hall at 7 a.m. September 7, 1911, the spirit of Mrs. Teresa Ann Hall passed peacefully to that undiscovered land from which no traveler ever returns. News has just reached us that Mr. Gabriel Grimes, of Jackson county, formerly an honored citizen of Madison, has passed over the dark river into the great beyond. It is customary, whether deserving or not, to say, of this good man would be enough that he lived the life of an honest, Christian citizen, is known by all who knew him. A devoted father and husband, a man who believed in the religion of the blessed Savior, his death will be regretted by all who knew him. Sad indeed were the hearts of Mr. and Mrs. Charlie Hardman Thursday July 1, when they realized that little Aubrey, their only child, had left them in the world of trials and care to be at rest with the angels above. When God in his infinite wisdom called from this world to that celestial City above. Mrs. J.B. Hendriks of Danielsville a beautiful and useful life was ended. Yet we know that God knoweth and doeth all things for the best therefore we say his will and not ours be done. On Sunday morning March 12, his spirit took its flight to God, who gave it. A good man has gone. He was never heard to speak ill of any one, which was a good trait that we all would do well to follow. Felicia, daughter of Mr. James and Mrs. M. H. Jaenkins, died of fever Nov. 4th 1989, aged about 30 years. 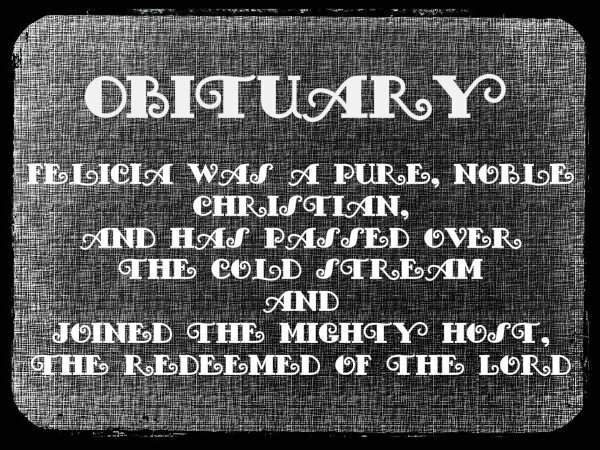 Felicia was a pure, noble Christian, and has passed over the cold stream and joined the might host, the redeemed of the Lord. Mary was a sweet bright baby, so affectionate that every one loved her. In the death of her another cradle has been emptied, another little angel has been added to God’s great white throne. She was the joy and the light of the home which she was permitted to cheer for only a short period. The language is beautiful and reflects an assurance from those who lived under the commands of Jesus in redeemed, holy lives of the place to which the departed would be soon met. The Savior is mentioned. There is acknowledgement of who gave us our spirit. There is understanding of where the saved dead go upon death. They reference the throne, and show the contrasts of life on this earth with the peace that is coming in the next. The Bible makes reference to death as sleep over 50 times, which the final obituary in my list above makes note of. When a Christian passes from enemy to friend of God, death is no longer the person’s enemy, either. In Jesus’ resurrection, death was conquered by death. We know this. This is the hope we have, that our sins are forgiven and we are now in right standing before a holy God, and He will bring us to His home in heaven when we die for an eternal life of peace and joy. We are no longer separated from Him in this life due to our sin, nor will we be separated from Him in the next, where His wrath is unleashed in hell upon those die still in their sin. The unsaved wonder. They seek knowledge of “the other side”. They try seances, gobble up books about near death experiences, elevate any person they think has the answer. They ask burning questions about whether life goes on, or if we return to dust as we came from dust. When death approaches them they are forced to contemplate their own mortality, and it is uncomfortable. The obituaries of the old timers were saturated with sadness, of course. We all miss someone who dies. Even Jesus wept for Lazarus though He knew He was going to resurrect him momentarily. Death causes tears. But death does not bring fears, not for us. Death comes to everyone, and when it strikes the saved family, it causes us to re-evaluate our lives. It does the same for the unsaved. But you can see the difference in the attitude toward death in the old time obituaries. Death for the saved is a passage, and a hope. Death for the unsaved is not. This verse is so perplexing to them! Our life is as nothing to us? How can that be? It is because of the surpassing treasure of infinite and eternal value. The exchange has been made: Jesus is our life now. In one sense, we are all dying. My body is dying and it will die and it will disintegrate in the ground,or wherever these old bones happen to fall. We are called to preach life to the dying, both saved and unsaved. For us it is a glory to hear and re-hear the work of Christ and His cross. For the truly dying in flesh and in spirit, they agonize over their mortality. However, preaching life also brings life. For those who are going to be in the Lamb’s Book of Life, we know not when our preaching to a sure election and calling will ignite the dead heart and hope will enter in. All men are spiritually dead apart from this gospel, they stand teetering on the precipice of eternal fire and torment with no hope of rescue but Christ, and we are commanded to preach to them this rescue. Natural disasters and national tragedies (like the Great Fire of London) serve as powerful reminders of the brevity of life and the impending reality of eternity. The memory of such events ought to motivate us, as believers, to live with eternity in our hearts and on our tongues (Rom. 10:13–15, 2 Tim. 4:1–5). Obituaries courtesy of the following site with its notice. Also fair use & public domain since pre-1923. USGENWEB NOTICE: In keeping with our policy of providing free information on the Internet, data may be used by non-commercial entities, as long as this message remains on all copied material.